Within the past few months, I've been faced with two major skincare challenges. First of all, we are having the worst cold and snowy Winter here in Northeast Ohio, and my skin is suffering the effects of too much dry heat in the house, too much cold and wind outside while shoveling snow (3 feet out there as I write!) and the resulting super-dry, chapped, uncomfortable skin. My second challenge isn't going to end when Spring arrives, if it ever does! The skincare line that I have been using for years, with beautiful results, has been pulled from the department store shelves and is now available only online until stock runs out. Yes, I'm talking about Prescriptives. After years of searching for the perfect skincare system for my post-menopausal skin, I was totally content with Prescriptives and very happy with the results I got from so many of their products.As I write my reviews for skincare items for this 40 In 40, these two challenges are the main focus in terms of what I am seeking and needing in skincare products. I won't be reviewing any Prescriptives items, but I will be referring to Prescriptives products in comparison to the products I do review. I'm approaching my 60th birthday. I've had a lifetime of very oily skin, which changed so quickly to super-dry soon after menopause, that it has left me with large pores and dry tight flaky skin. These two things combined are the main problem I face when looking for skincare. I need products rich enough to counter the dryness, and yet not too rich as to clog pores. I was sure I couldn't possibly be the only person with these issues. I was right. I saw an ad on TV for a new serum by L'Oreal, targeted at post-menopausal women. It's part of their Age Perfect line, and on their website they even refer to it as "Anti-Menopausal." I was definitely intrigued. I hoped it would help with the dry skin, and possibly replace Prescriptives Super Line Preventor Extreme in my skincare routine. Serums work well on me. My lovely PX makeup artist had explained serums to me. They help moisturizers to work better. Many of them contain state-of-the-art ingredients such as antioxidants and vitamins, and they feel very soothing on the skin. 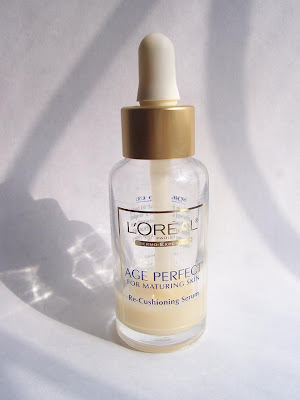 I caved on the L'Oreal Age Perfect For Maturing Skin Re-Cushioning Serum as soon as I found a bottle at the local drugstore. This serum is packaged in a clear glass bottle with a dropper-cap. It's easy to dispense just the right amount, without waste. The product itself has a slight fragrance to it, but it smells clean and not perfumey. I love the silky feel on my face, and it absorbs quickly. My skin looks glowing but not greasy, and it relieves dry skin discomfort almost immediately. I find it to be less sticky than Prescriptives SLPE, and more dry-skin-quenching too. I can apply a moisturizer over top of the serum right away. The serum seems to boost the effect of any moisturizer I use on top of it, and the effects last all day, too. I'm not getting clogged pores from this product, and the dry flaky patches are visibly diminished. I use this serum religiously every morning after cleansing my face. You can see from the level of product in the photo that I'm happy with this serum and will definitely be repurchasing. I'm planning to try all of the rest of the Age Perfect line that L'Oreal is offering, including a few new items recently launched. I am hoping that L'Oreal will re-introduce the Age Perfect foundation as well. It's been discontinued here in the USA but I see that it has been re-introduced in other countries. I love that L'Oreal has targeted women of my age group and our particular skincare needs. I love that I can begin to find replacement products for my Prescriptives items without breaking the bank. Drugstores often have weekly specials and sales on L'Oreal items, and that's the time to stock up. I do not know of any other drugstore line that offers a serum at this time, but I'm perfectly happy with the Re-Cushioning Serum and I don't feel the need to try anything else. I applaud L'Oreal for this great product! Disclosure: This product was purchased by the reviewer. I am going to have to try this one P! L'Oreal skincare is underrated. There are many gems in that line. I've noticed many, many coupons for L'Oreal products (skin, hair, and makeup) in the Sunday coupon section of the paper and the Redplum coupons I get in my mailbox a few times a month. 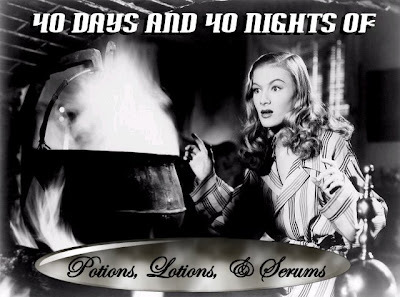 It could make this serum even more of a bargain! Thank you so much for this review. I have exactly the same skin issues and haven't found anything so far that works, so needless to say I'm going to rush right out and get myself a bottle of this stuff toot sweet. Annie, we will look for a L'Oreal sale! Melanie, thank you! The photo was taken on my makeshift "seamless" table near a leaded window on a sunny morning with just natural lighting. I like the way it turned out! Chickadee, isn't it great that the drugstores offer deals and coupons, that's the time to buy! Popcarts, I'm glad I am not the only one with such odd skin issues. I hope you love this serum as much as I do! "Toot sweet" is too cute! Chris Benz at Saks Fifth Avenue!